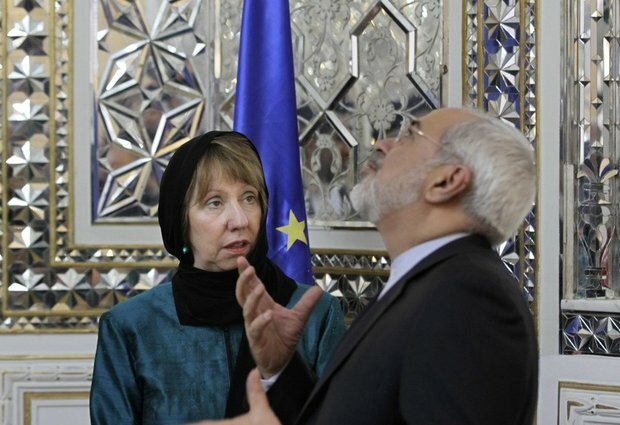 Just about the only semi-newsworthy report to have emerged out of the latest round in Vienna of negotiations on Iran’s nuclear project is the fact that Iranian foreign minister Muhammad Zarif had cancelled a dinner date with EU foreign policy chief Catherine Ashton. Viewed against the presumed big picture this is a negligible item, bordering on preoccupation with idle incidentals. Yet, as such, it’s highly significant. It almost goes to show that there’s really no big picture. Supposed talks with Iran continue sporadically and constitute the pretext for alleviating sanctions on the rogue regime’s nuclear ambitions. But in effect, nothing is happening. Another session of imaginary haggling comes and goes and all that’s left to tell is the fact that Ashton was denied the pleasure of dining with Zarif. The cancellation is her punishment for having, according to the Iranians, “breached protocol” by having hobnobbed with opposition representatives on her recent trip to Tehran. There she effusively tried to curry favor with the powers-that-be and even demonstratively donned a striking black headscarf to both cause no offense and to overenthusiastically ingratiate herself. Her fawning demeanor reflects prevailing attitudes in both the US and EU. Pathetically crumbling before the entire watching world is the strategy of resorting to stringent sanctions to force Iran to give up the program that would enable it to develop nuclear weaponry. As European firms rush with alacrity to close deals with Tehran, the residue of the pressure on Iran becomes a derisive reminder of unkept promises and hollow declarations of intent. Iranian representatives, newly confident and insolent, show no inhibitions in thumbing their noses at their pro forma interlocutors. They have ample reason to be cocky. They know that at best the entire show of negotiating at Vienna is a waste of time. Its subtext aim is draw out the process and in the interim Tehran will regain legitimacy. Its nuclear threat will be increasingly pooh-poohed while its centrifuges will keep on turning and enrich more uranium. However, easing fears about Iranian intentions while not abrogating the atomic-bomb scheme itself is only the preliminary sham. Iran’s standing has been radically enhanced via the Russian-Ukrainian conflict. Russia has throughout been Iran’s main backer in the international arena. Now that Russia is at loggerheads with America and Europe over Crimea, there’s even less incentive for Russia to cooperate with the western effort to curb its leading protégé in the Mideast. That, actually, is putting it very mildly. Since the bark of the Obama administration and its European sidekicks is considerably worse than their bite, the Russians are hardly deterred by the ludicrous punitive measures adopted against them. Moscow’s fundamental geopolitical interests way outweigh denial of entry visas to its VIPs. But the hectoring from western capitals is like an irritating mosquito sting. It isn’t really harmful but the agitation it provokes is nothing to scoff at. A vexed Kremlin means appreciably less accommodating Russian negotiators at Vienna, and this on top of the fact that they were hardly obliging partners to begin with. There’s no incentive for them to as much as keep up previous pretenses, considering the weakness displayed throughout by the Obama White House. The shortsighted 2009 unilateral American retreat from establishing a missile shield over Poland and the Czech Republic had already cast Obama in Vladimir Putin’s eyes as a paper tiger and Putin hasn’t spared Obama recurrent humiliations. The upshot is that the apparent diplomatic offensive against Iran’s nukes is fast evaporating. Even top American experts concede that there’s no chance for actual success. Cementing Iran’s status as a nuclear threshold state has evolved into the best case scenario. That’s how nightmarish things have become. The ostensible pressure on the ayatollahs was to start with spurred by Israeli threats to deal with Iran by itself and by military means. As Israel’s warnings lost volume, so they lost effectiveness. The international community’s prime motivation to lean on Iran was gone. Reviving it perhaps is the logic behind Defense Minister’s Moshe Ya’alon’s assertion Monday that Israel cannot rely on Washington to thwart Iran. The US and the EU have long ago CAPITULATED on Irans nuke program…EVERYBODY knows this ! In fact, the US have capitulated on Iran since the hostage crisis and the bombing of the army barracks in Lebanon. The US has always been >>>>AFRAID<<<< to stop Irans support of terrorism and it's pursuit of nuclear arms and ballistic missiles. The 9/11 report CLEARLY mentions Irans support for the highjackers…but the US bombed some empty caves in Afghanistan instead ! Oh yes, it was easy to chase the Taliban stone time barbarians and to do NOTHING against their Iranian supporters,,,the same with Lockerbie. NO ONE in his right mind will believe, that the US will ever attack Irans illegal nuclear facilities. The Crimea crisis is not even worth mentioning…ONLY the IDF can stop Iran at this point in time…. I don’t know why anyone expected a different outcome. The west will never understand that negotiations for Russia and the ME (I would include China but they aren’t the subject of the article.) is nothing more than another form of warfare. Maybe even people like future contenders for the US presidency, like Hilary Clinton, would express their support for a preemptive Israeli strike. With the US midterm elections in November fast approaching, Israels leverage for decisive action against Iran is higher than at any time of Obamas term. Obamas Middle East policy has failed on Iraq and on Egypt and on Syria and on Iran and even the Americans understand that sorry state of affairs. A successful Israeli operation would finally clear the air and would draw unexpected applause from the American lawmakers and their electorate. THERE IS A BIG WINDOW OF OPPORTUNITY !